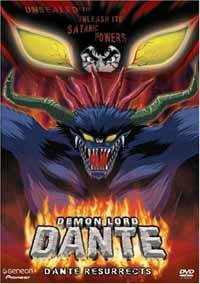 Notes: Based on a manga by Go Nagai and, despite what the name may indicate, this anime is not related to the game series Devil May Cry, which featured a protagonist named Dante who could change into a demon at will. I really know exceedingly little about this show and even if I DID find out something, the chances of me updating this review are 1 in 80,982,476,900,204,592,147. The city is in turmoil. Mass murders of women are abound and their hearts are ripped out by demons. Enter the brave hero who escapes a motorcycle accident and gains a strange power (Arjuna will soon be handing this show a lawsuit) that allows him to (painfully) see the women while being chased by the demons. It's around the end of the first episode that the plot dissolves faster than sugar in coffee. Demon Lord Dante is what you can expect from some of Go Nagai's work: total and senseless gore not worthy for a TV screen. No show has ever driven me to levels of mind shredding as this one has. Plotwise, all you have to do is add Go Nagai to the show Arjuna and you have a similar plot to this show. Hero manages to wipeout on his motorcycle and cheat death. Hero gets super powers and a little device called the Deus Ex Machina to reveal demons who were causing the killings of women in the town (no doubt being an insult to all women at the same time, considering the fact that not ONE MAN gets killed in the first episode with four synchronized killings to women). The plot, despite the cliche, is oddly the SOLE THING worth remembering since it is engaging enough to erase the interest in everything else, causing the fact that this show reeks somewhat of Go Shogun's style of action. What is being provided as a soundtrack reminds me of second-rate action video games. No originality and a maddening lack of real musical planning with the theme song being the only song well placed and nicely tuned, causing one to ruin the tape just rewinding to the beginning each time over and over again. As for the other stuff music-wise, send it into the sunset, just so a whirlpool can swallow it. The characters are also too cheesy and thin. The protagonist is a loser obsessed with demons with the bedhead (which reminds you of Violence Jack, making the Lawsuit Count at 2) and the sideburns that remind you of cottonballs who suddenly gets supernatural powers. His sister is a noninteresting character who, when you initially see her, you'd bet she goes to Higurashi Kagome's school just because her sailor fuku is almost an exact replication (Lawsuit Count: 3). The other people have warped personalities, with the hero's father's face looking like a diamond. Just another example of why this anime tends to insult. As you can imagine, Demon Lord Dante and Violence Jack both share similar styles in artwork, showing off all four types of blood and fanservice in unnecessary depth. Too bad the animation quality is total kitsch. Just to give you an example of the "quality" of the animation, I'll describe a non-spoiler scene for you. Two birds are perched on top of the hero's house, singing songs while moving their heads in such a way that they should have gotten whiplash. The same goes for a scene where the man (Ryo, as far as I can remember) is eating some stew when the small bit of stew is apparently floating off the spoon by a good bit (proceeded by his sister saying the line "My hubby will be a very lucky man. I'll cook for him every day" which ends up with her wanting to learn a new recipe "so he won't want to leave me".) This just violates Women's Lib and makes me want to punch myself. Japan's original may have had good voice actors, but this dub adds some salt to already open wounds as you screech in pain from it. The US voice actors have as much enthusiasm as my 4th grade reading classmates. This just adds on and makes an already nasty show into you worshipping at the porcelain altar. Fanservice and satanism are abound everywhere possible in this show, so you can get a good idea where this is going. The monsters are horrible unimaginative and one-dimensioned. Under no circumstances should anyone want to watch this. I have recently watched this anime's third episode, but nailed the "end" button ASAP as soon as the aquarium's wildlife started sprouting demon heads that talked to one another. At the time, the last episode was #4, which I watched after the first three (as it turns out, there are about 8-16 episodes). Not only does the princess, under the flames of the ritual, have a similar appearance to Lunar Silver Star Story's Jessica (Lawsuit Count: 4), but it also seems to break an unwritten rule of films mentioned by Pulitzer Prize Award winning critic Roger Ebert that when a name is repeated often in a given period of time, you start laughing uncontrollably, since "Demon Lord Dante" is repeated about 75 times in the whole 24 minutes. I kid you not. In my opinion, the only way to describe this show is "Stay away...far...far...away." Recommended Audience: When he did his review for Violence Jack, Stig proposed a new rating: FI (Friggin Insane). Because of the fanservice, blood, gore, murders, satanism, stereotypings, and et cetera, guess what this show gets? No one should watch this.